In Memory of Tommy, Timmy, John, Rob & Michael. Please meet Michele at Seaford High School on Saturday, August 11th, 2017 at 3:30 PM. 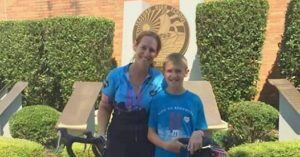 She will be completing her bicycle ride from Buffalo to New York City at Seaford High School. If you would like to meet her at her prior stop and ride you bike with her to Seaford High School, she will be visiting the Towers of Freedom at John J. Burns Park in Massapequa just before heading to Seaford.